1CX gets updated styling, better lights, improved electrical components and longer available loader arms. The smallest member of the JCB loader/backhoe family has just gotten a face lift that adds new muscle and convenience too. The 1CX gets new servo controls, better electrical switchgear, longer available loader options, a new appearance and an extending dipper option. At the rear, the dipper option adds up to 20 inches to the digging capabilities of the machine, extending its reach downward to 10 feet. This also allows for easier loading of the center of dump trucks. The new power management system keeps the engine at the optimum torque during digging and pile driving operations. 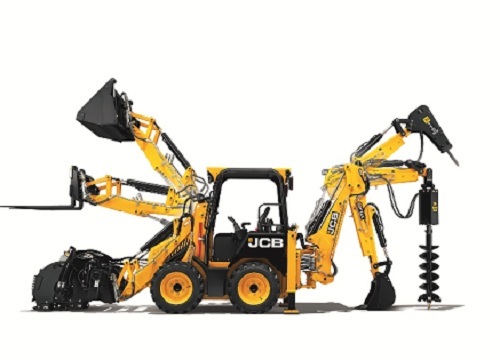 JCB has done a major redesign on its 1CX, the smallest member of its backhoe loader family. The revamp includes form and function refinements and a power management system. Here, a variety of implement options are shown in an "octopus" photo. On board, the new cab includes ergonomics that don't require the operator to lean forward while working the rear excavator. Optional servo controls for the backhoe provide the operator greater control and less effort -- and with the removal of the center control post, more room. Consumers can choose between the SAE or ISO control pattern with the use of an optional changeover switch. A better seat, more leg room are available with the redesign as is the disappearance of foot pedals for auxiliary functions which are now control solely by the servo levers. The 1CX is powered with a 50 horsepower engine and provides customers with a maximum loader lift capacity of 1,323 pounds.